FIBROUS FASCIAL TISSUE COMPOSITION. PERMISSION JOSEPH E. MUSCOLINO. KINESIOLOGY – THE SKELETAL SYSTEM AND MUSCLE FUNCTION, 3RD EDITION (ELSEVIER, 2017). The morphology of fascial connective tissue may play an important role in locomotor mechanics. The connective tissue, more specifically the deep fascia, can impact range of motion in two ways. 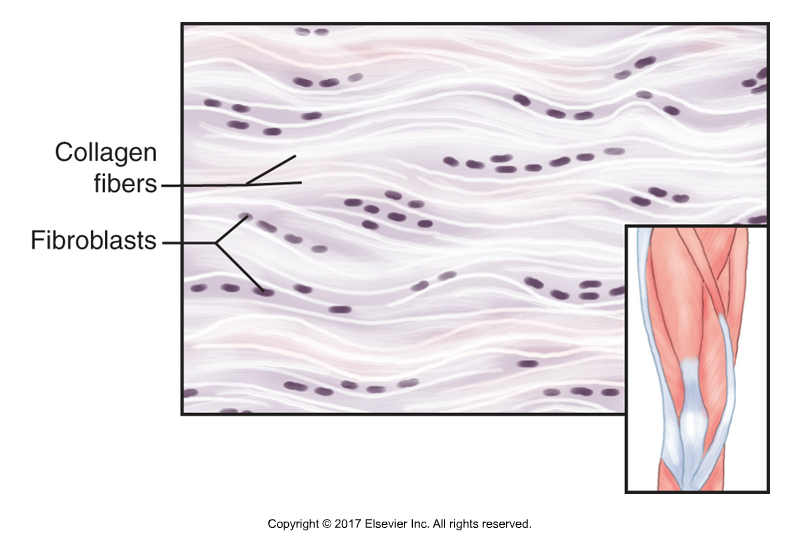 First, fascia is connected to the underlying muscle along its full peripheral length. Changes in the fascia’s mechanical properties (e.g. altered stiffness) might restrict the ability of the musculature to lengthen. Secondly, fascial tissues have been demonstrated to morphologically link muscles arranged in series across a joint (i.e., the concept of myofascial meridians / anatomy trains). Due to this architectural feature, fascia can directly affect joint range of motion. And indeed, recent research has shown an association between increased fascial thickness and joint flexibility in patients with chronic pain. FIBROUS FASCIAL PLANES OF THE LOWER EXTREMITY. 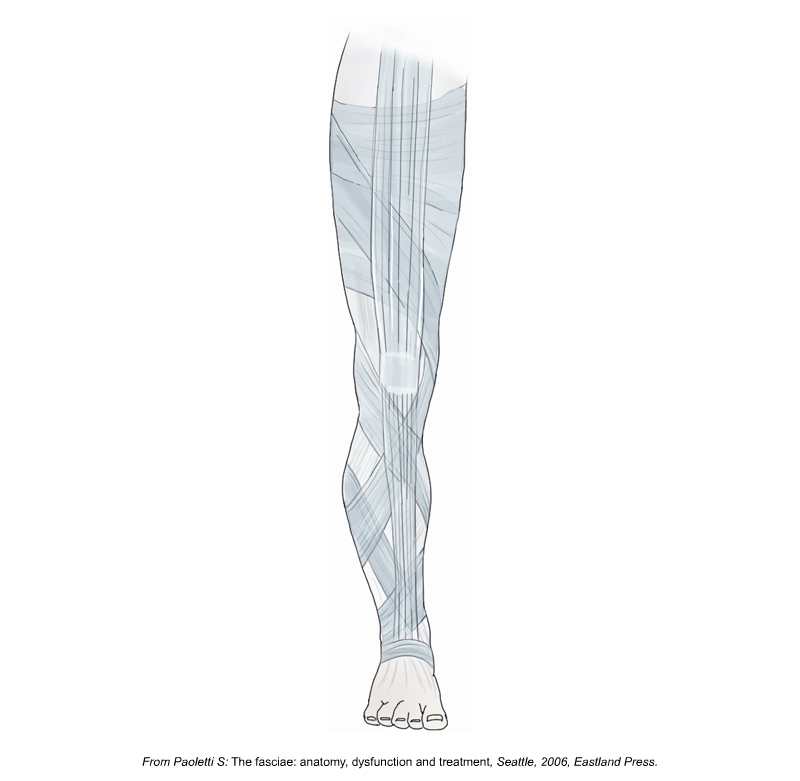 MODELED FROM AN ILLUSTRATION BY PAOLETTI, S., THE FASCIAE – ANATOMY, DYSFUNCTION AND TREATMENT (EASTLAND PRESS, 2006). PERMISSION JOSEPH E. MUSCOLINO. KINESIOLOGY – THE SKELETAL SYSTEM AND MUSCLE FUNCTION, 3RD EDITION (ELSEVIER, 2017). A new study published in Journal of Anatomytested the hypothesis that fascial thickness changes with aging. Young (n = 18, 22 ± 1 years) and old (n = 17, 69 ± 4 years) healthy females were recruited for a quasi-experimental, cross-sectional trial. All participants underwent standardized ultrasound-based thickness measurements of the deep fasciae of the trunk and lower limb. Results showed between-group differences in fascial thickness. Young adults exhibited higher fascial thickness of the anterior and posterior (lower) leg, anterior thigh and abdominal wall (+12.3% – 25.8%). Conversely, older adults showed thicker fascia in the lumbar spine (+40.0% – 76.7%,). There was also a correlation between body mass and fascial thickness. The authors suggested that increased fascial thickness in the lumbar spine of elderly and increased fascial thickness in the legs of young persons, implied that the connective tissue dynamically adapts to the forces acting upon it. Higher muscle strength and higher body weight require a thicker connective tissue, which is able to withstand and transmit greater forces. The clinical implications suggest that, in addition to the frequently examined skeletal muscles, fascia should also be assessed when working with clients who have musculoskeletal disorders. Fascial thickness may become a valuable outcome parameter in the prevention and treatment of musculoskeletal disorders, such as neck or back dysfunction, but this topic warrants further investigation. The authors suggested that age-related changes in fascial thickness may be a contributing factor of restrictions in joint range of motion. Further study delineating the cause-effect triangle of body mass index, flexibility, and fascial thickness is necessary. 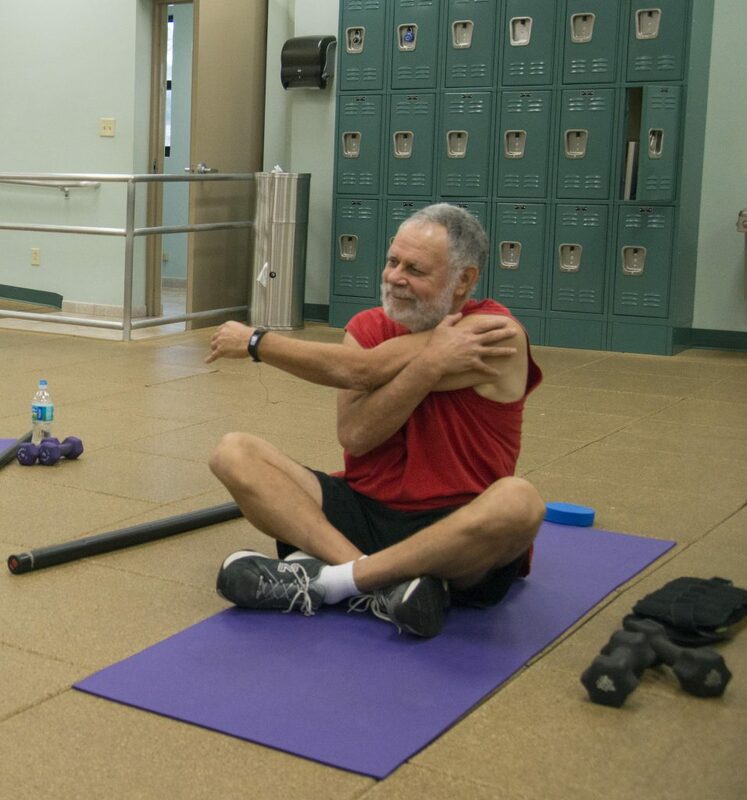 It is a general truism that as we age, we tend to lose flexibility in our body. This is especially true regarding spinal motion. Perhaps much of this lost joint range flexibility is due to the increased thickening of fascia as we age. The implications for manual therapists might be to not only perform soft tissue manipulation (massage) in a muscle-specific manner, but to address the larger fascial planes and chains of the body. Similarly, movement professionals might want to also change their focus from being muscle-specific to be more myofascial meridian-oriented, pan globally across the body.